We can use VBA to Clear only the Comments of a specific range, cells or entire worksheet. we can use ClearComments method of Range Object. Rang.ClearComments method will clear only the comments in a range. And the data, formats like border, font styles, background cell will remain same and will not be disturbed. Here is the syntax to clear the comments in a range. 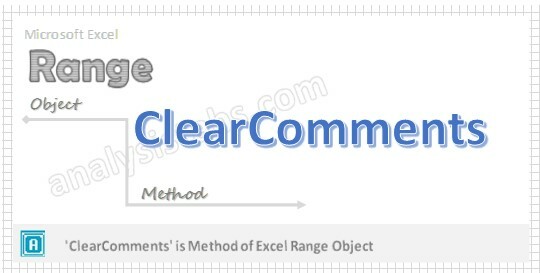 You can clear the comments in any range or cells using VBA Range.ClearComments method. The below macro will show you how to clear the comments in a range using VBA. In this example, we are clearing the comments in range “A2 to D10” using VBA. Enter some data in any cells in range “A10 to D10” to test this macro. Also format some cell and insert some comments for testing purpose. Press ‘F5′ to run it or Keep Pressing ‘F8′ to debug the code line by line. Now you can observe that the comments in the range “A2 to D10” are cleared. You can apply any formats and background color, and try this macro. This will clear only the comments. And formats and the data will be remained same. If you want to clear everything including formats and data, you can use Range.Clear method, to clear the data in a range you use the Range.ClearContents method. Range.ClearComments: Will clear only the comments. And the data and formats of the range will remain then same. Range.ClearContents: Will clear only the content/data of the range, formats will remain same. Range.Clear: Will clear the data including cell formats.